A paradise for water lovers, the Ammochostos district, has some of the most amazing golden sandy beaches in the Mediterranean. 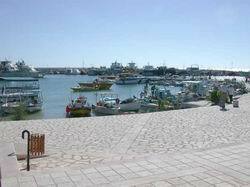 The charming scenery includes the tiny fishing harbour of Agia Napa, and the medieval monastery in the heart of the village, the windmills and small churches in the surrounding villages, which spread out in the area of Paralimni and Protaras. The region is known as "Kokkinochoria" which means "red-soil villages", since the soil of the whole area is deep red in colour, due to a very high metal oxide content. This is the main potato-producing area on the island. The villages of this area are equally known for their folk-poets, who are regarded as the best on the island. Originally a small fishing village, this is now a major tourist centre. Famous for its nightlife, Agia Napa is determined to maintain its popularity in this area. This resort is build for fun in the sun! So, if it is fun you are looking for, day and night, this is the place to be. Here are some of the best beaches on the island: Agia Napa Beach, Macronissos Beach and Nissi Beach. Once you've been there you don't want to leave! Besides just lying in the sun, there are also some places to visit. There interesting medieval monastery dedicated to our Lady of the Forests in the middle of the village, has a 16th century church partially underground cut into the rock. The hostel, west of the church, belongs to the World Council of Churches. 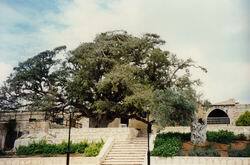 The ancient sycamore tree, in front of the south gate, is believed to be 600 years old. Protaras and Pernera occupy the farthest south-eastern corner of Cyprus accessible to visitors. Lying in the municipality of Paralimni, this charming resort is ideal for family holidays. It has the same beautiful beaches as Agia Napa, but lacks the busy nightlife, making it quieter and more relaxing for a family. This is the place to relax in the sun and try to get as much tan as you can. When you feel like doing anything else - once you get with the rhythm it's not easy to get out of it - take a walk by the harbour or to Profitis Elias. This little church is situated at the top of a rock face, dotted with caves. The view is breathtaking from up here.